bod [包家巷] - Limpid Fear [清澈恐惧]. Planet Mu. Knives are proud to present an album by LA based artist, Nicholas Zhu aka bod [包家巷]. 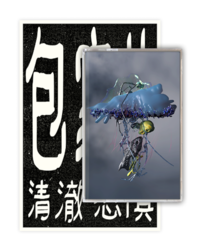 Presented as multiple arrangements forming a continuous 'mixtape' of sorts,'Limpid Fear [清澈恐惧]' is a limited edition cassette which highlights Zhu's contemporary songwriting, drawing heavily from the instrumentation of their Chinese heritage, as well as classical chorus and composition. The pieces meander between sentimental ambient pop, traditional string ragas, harsh noise and digital textures. The cassette is packaged with a double sided risograph print, with artwork by Tea Stražičić and calligraphy by Jade Novarino.